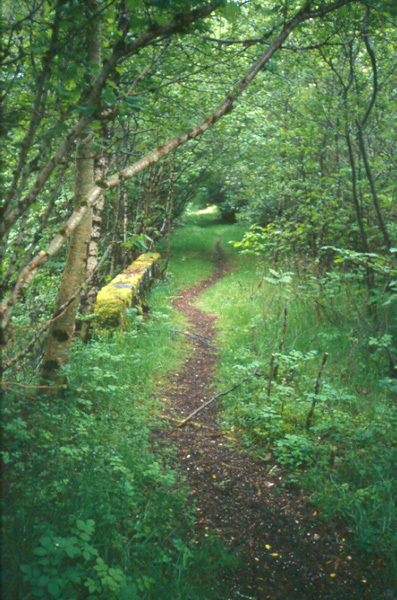 Two old railway trackbeds combine with more recent forestry tracks to give walkers a high level taste of Glen Dochart. The route follows the old Killin branch railway up out of the village of Killin, on the shores of Loch Tay, before switching to the trackbed of the former Callander & Oban railway as it rises through the trees to the head of Glen Ogle. Both routes closed to rail traffic in the autumn of 1965 following a rockfall in Glen Ogle and, with the rails now gone, the old trackbeds are ideal terrain for walkers and mountainbikers. This route is suitable for both. The network of tracks through Achmore Forest are a more recent addition to the landscape and outdoor adventurers are actively encouraged to make the most of them. The trees are still low enough not to block out the surrounding scenery. Wander through the woods and there are excellent views over Killin and Loch Tay to craggy Meall nan Tarmachan and the neighbouring Ben Lawers range. Start at the bridge over the Falls of Dochart and head out of Killin on the A827. At the end of a row of cottages on the left a track strikes off to the left just before you reach the town's war memorial on the riverbank. It skirts in front of two large houses to reach a high gate. Here there is a notice board indicating walker-friendly routes through the forest. Go through and bear right immediately, following the trackbed under a bridge. Continue up the line as it rises very gently through the trees. A mile and a half on - beyond Acharn Farm - the line is crossed by a forest track. Carry straight on here, following a narrow path as it disappears into woodland beyond a gate. It's a little overgrown here but very shortly the path widens back out to track width and emerges eventually at the A85 above Lix Toll, just beyond a barrier gate. Cross the trunk road. Take care as visibility is not great in either direction and traffic does burl along. Pick up a track on the opposite side. This continues to rise at a gentle gradient to reach the former Killin Junction Station where an old platform and ruined station cottages lurk in the undergrowth. The branch was built in the 1880s, using money from the wealthy laird and his subjects to link Killin with the Callander & Oban Railway. The station here was intended only as an interchange and was never accessible by road. As you approach the junction another railway trackbed comes down on the left to meet the route. Turn back on to this where the two meet and follow it east as it rises through the coniferous forestry curving gently right. This is the Callander to Oban line and you are now heading in the direction of Callander. You may spot deer if you go quietly. The track climbs and curves right to reach Glenogle Cottages at the northern end of Lochan Lairig Cheile. Recent tree felling means there are views to Loch Tay to enjoy. This was the site of a crash involving an RAF Tornado aircraft a few years ago. Just before the houses, a narrow path branches left taking you to the main road. Cross and climb up to the car park and picnic area on the other side. There is usually a snack van parked here and the burgers come highly recommended. Follow a track through the picnic area to a high gate, pass through and continue along the track as it skirts round the hillside through forestry, enjoying panoramas over Glen Dochart, Killin and Loch Tay. Two miles on, the track reaches a T-junction. Turn right and climb up to a bridge over the Achmore Burn. The ascent is short but steep. Cross the stream and go along the track until you reach an exposed section of pipeline and a wooden gate in the high forest fence on the right from where the detour to Lochan nan Geadas starts. Across the fence, a narrow path climbs through the heather following the Allt Lochan nan Geadas to Lochan nan Geadas. The path is vague and easily lost, but stay with the burn and you will reach the lochan. There's a vague path round the shore and another smaller lochan due south. After visiting these, retrace steps to the forest track. Carry on along the track and it curves right to reach a tall transmitter where you leave the forest plantation at a high gate. At the next junction, turn left and a tarmac track passes through a gate and descends steeply through forestry to meet up with the public road at the bottom. Turn left and follow this for the last mile into Killin, finishing up at the spectacular Falls of Dochart. Start Falls of Dochart in Killin (grid ref NN 573325). Parking Well signed free public car park 100 yards north of Falls of Dochart. Grading Solid tracks with a final section short along a quiet country road. Further reading The Killin Branch Railway by Colin Hogarth (Stirling District Libraries, 1993). To order a copy, send a cheque/PO for $3.75 (inc P&P) to walkscotland.com, 20 Hercules Place, Arbroath, DD11 4HT. Please indicate if you would like it signed by the author.